This walk is within the small Boyagarring Conservation Park. 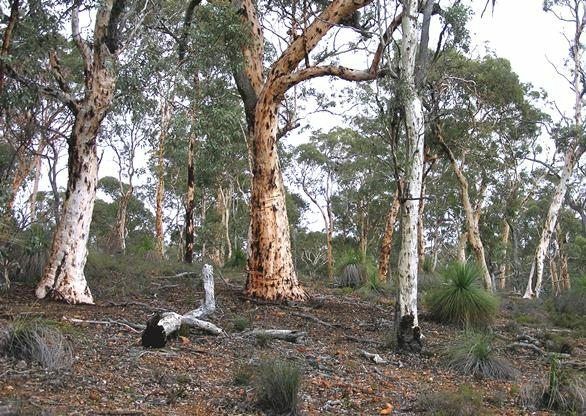 The Park protects one of the ‘islands’ of remnant bushland within the wheatbelt east of the Darling Range, similar to those at Boyagin, Dryandra and Lupton. 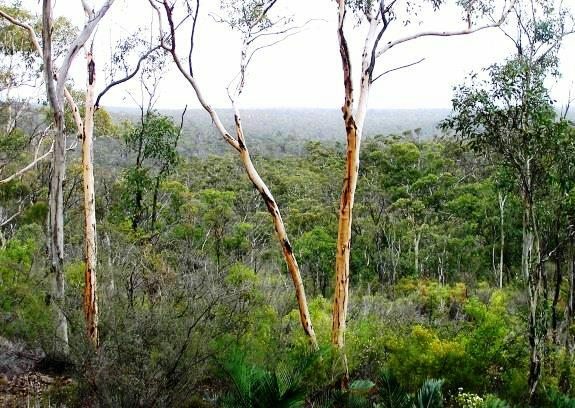 The slopes and gullies along the laterite breakaways bordering the small central uplands of Boyagarring Hill provide for some very enjoyable, mostly easy walking through mainly open, picturesque wandoo woodlands. There are some pleasant views to the surrounding farmland. The walk can be shortened if preferred. This walk is within the small Boyagarring Conservation Park. 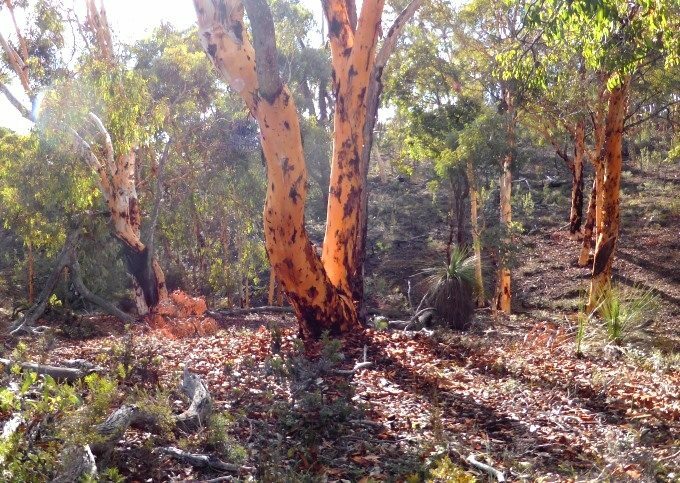 The Park protects an ‘island’ of remnant bushland within the wheatbelt east of the Darling Range, similar to the nearby Lupton Conservation Park (less than 10km SE), the Boyagin Nature Reserve (about 30 km ESE) and Dryandra Woodland (about 60km southeast). 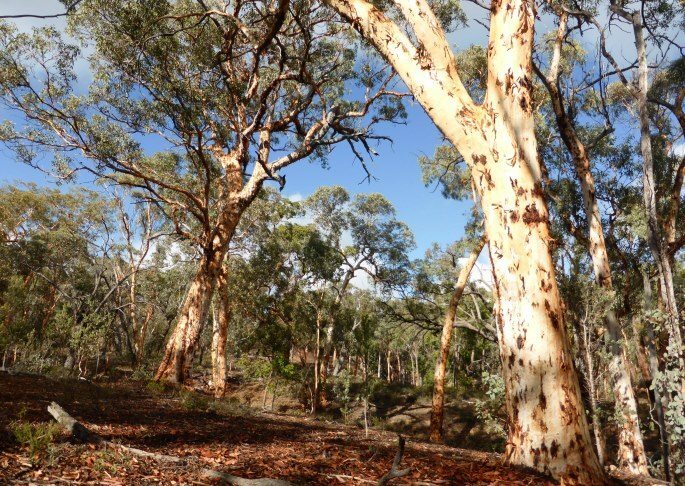 In the case of Boyagarring Park, only a very narrow fairway of wheatbelt farmland along Gibb Gully separates the Park from the extensive State Forest areas of the Darling Range to the west. 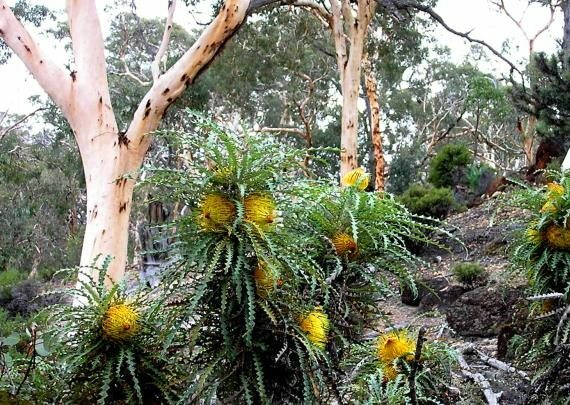 Like Lupton Park, Boyagarring Park is not well known and is much less visited than Boyagin and Dryandra. 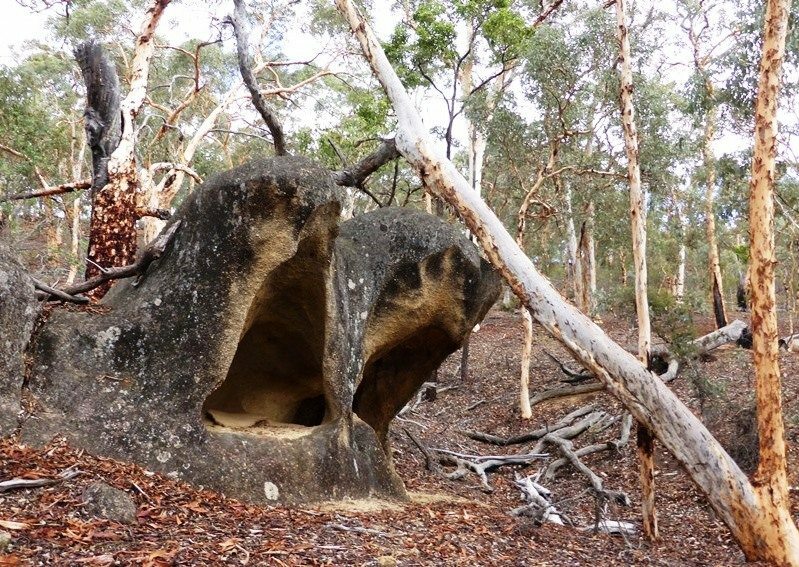 The Park covers an area only about 3km x 4km, but the slopes and gullies along the laterite breakaways surrounding the small central ‘plateau’ area of Boyagarring Hill provide for some very enjoyable, mostly easy off-track walking through mainly open, picturesque wandoo woodlands. There are some pleasant views to the surrounding farmland and across forest from the breakaways and from a granite outcrop in the east. 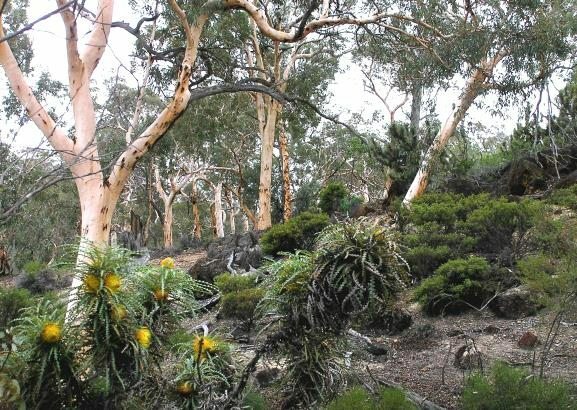 Patches of quite thick shrubland (mainly ‘Pingle’; Dryandra squarrosa) cover some of the slopes, but are mainly avoided by this walk route. Shorter walk option: The route can be easily adjusted on the day to give a slightly shortened walk of about 12km, bypassing the SE section in the later part of the walk. (See Route notes for details). From the start point (at waypoint ‘START’) head NNE and follow a minor but well-defined narrow track up the gentle slope. The track veers northward at ‘1-1’, crosses a small gully, then veers right at ‘1-2’ to head upslope via ‘1-3’. 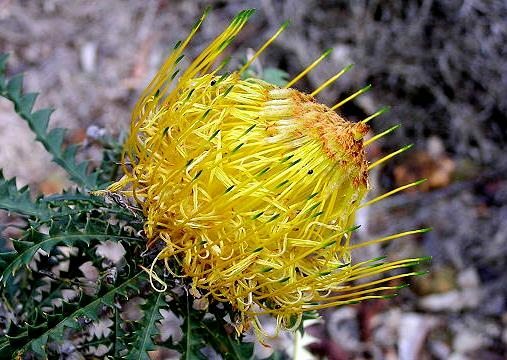 Continue northward on the track as it climbs gently uphill through quite dense Pingle (Dryandra squarrosa) shrubland. At about ‘2’veer right to leave the track and head NE up the steepish hillside, picking the easiest route through the shrubland. Veer ENE at ‘2-1’. The slope flattens before you reach ‘3’ near the hilltop. 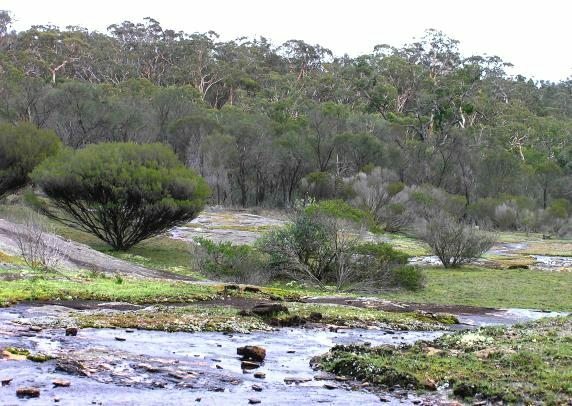 (At 371m this hill top is only a few metres lower than maximum elevations of 374m which occur on local hilltops along a ridge about 1km further east. Boyagarring Hill doesn’t have a single, distinctive summit). Veer right (ESE) and descend to soon reach a flat area at ‘3-1’ where small outcrops are broken by patches of heathland. Continue to ‘4-1’, then veer sharp left and head roughly northward via ‘4-1’ and ‘4-2’. At ‘5’ veer left (NW) along the south side of a gully which narrows and deepens northward. Veer right (northward) at ‘6’ to soon cross the gully and traverse a steepish pebbly slope through woodland before crossing two more narrow gullies.Veer right (eastward) around a steepish hillside via ‘7’ and ‘7-1’, then veer NE-ward to reach an outcrop after ‘7-2’. Cross the outcrop via ‘8’ and ‘9’ and head northward, crossing another gully at ‘9-1’ and reaching a broad laterite-capped ridge at ‘10’. Veer right (eastward) partly though denser shrubland, to soon reach a rocky laterite breakaway at ‘10-1’, from where there are good views to nearby farmland to the north. 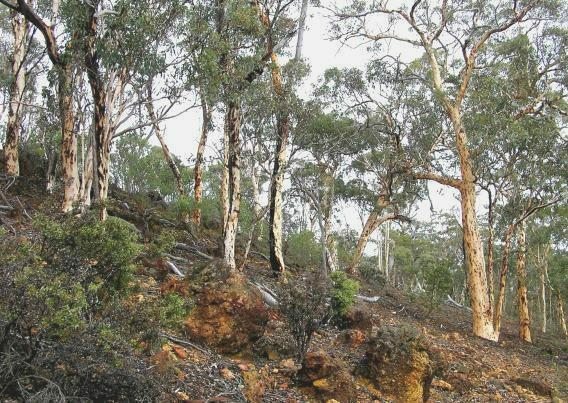 Veer ESE, partly continuing through the open wandoo woodland along the slope below the breakaway and in places partly through the shrubland/light forest above the escarpment . At ‘11’ veer left to head downslope and eastward via ‘11-1’. Veer right (ESE) at ‘12’ initially along slope, then at ‘13’ veer right (SE) to descend to cross a stream course at ‘13-1’. Climb gently again into open woodland via ‘13-2’ and cross another stream course. Turn sharp right at ‘14’ and head SSE gently uphill to soon reach (at ‘15’) an eastern breakaway slope with a view east through the open wandoo woodland to wheatbelt farmland. Turn right (SSW) to cross the crest of a small spur ridge at ‘16’. Veer right (WSW) across the head of a small rocky gully to reach a broad, flat granite outcrop at ‘17-ROK’. Continue WNW across the outcrop for 200m, gaining a view northward over the woodland down the valley. This outcrop is at about the halfway point on the walk and is a nice spot for a rest break and/or lunch. 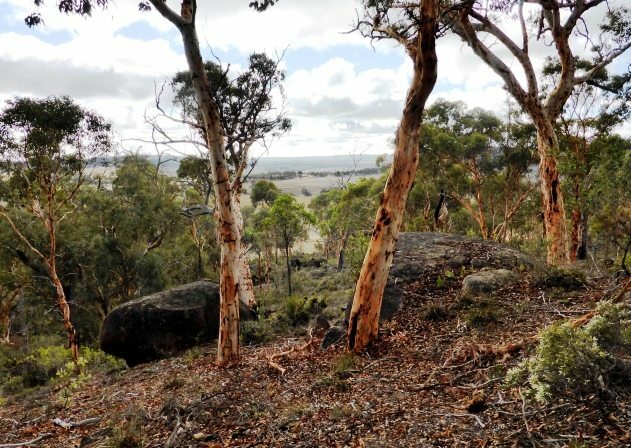 At ‘18’ veer sharp left (initially WSW) and climb uphill through shrubland via ‘18-1’ to reach wandoo woodland again on a local hilltop on the ridge. 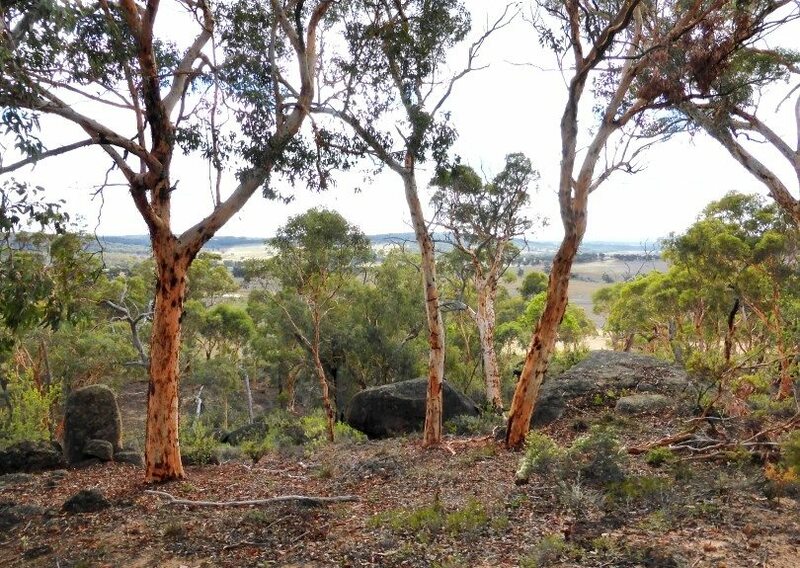 (This ridge is effectively the summit ridge of Boyaggaring Hill and this hill top is one of the two equal highest points along the ridge with elevation of 374m.) Veer left to head SE gently down the ridge, and through some fairly open Parrot Bush shrubland to reach (after about 400m) the edge of the laterite-capped plateau (or mesa). Veer ESE at ‘19-1’, to descend the upper breakaway slope to reach at ‘20-RK’ a distinctive rock hollowed by weathering. Continue along slope to reach the edge of a gully at ‘21’. Turn right (SW) to follow the north slope of the gully, then at ‘22’ turn left (SSE) to cross the gully. Continue SSE via ’22-2′. (Or see Option below for a shortened walk.) Skirt patches of thicker shrubland if necessary and soon reach an open slope covered in quite thick, medium heath, with views to nearby farmland. 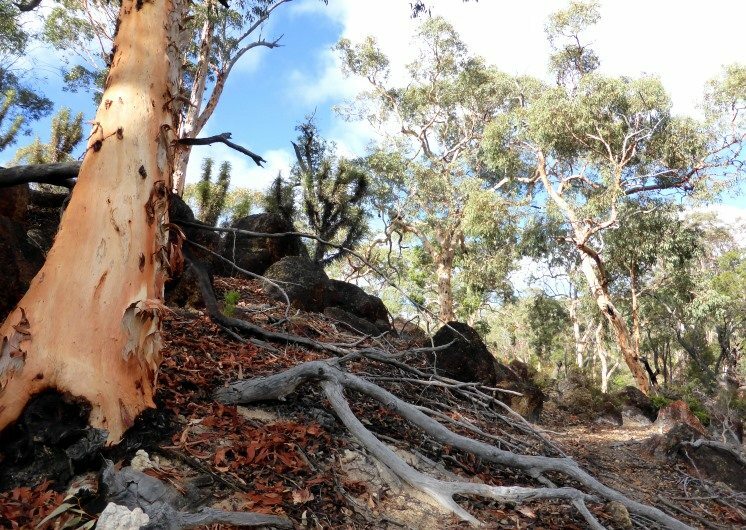 Follow a kangaroo trail near the upper edge of the heathland and soon descend to reach the Park boundary vehicle track at ‘23’). Follow the track southward for about 300m to a gully at ‘24’then veer off-track SW through fairly open mixed wandoo-jarrah forest. Veer right (westward) at ‘25’ to cross the crest of a ridge. Continue westward around the south-sloping hillside via ‘25-1’ and ‘25-2’. 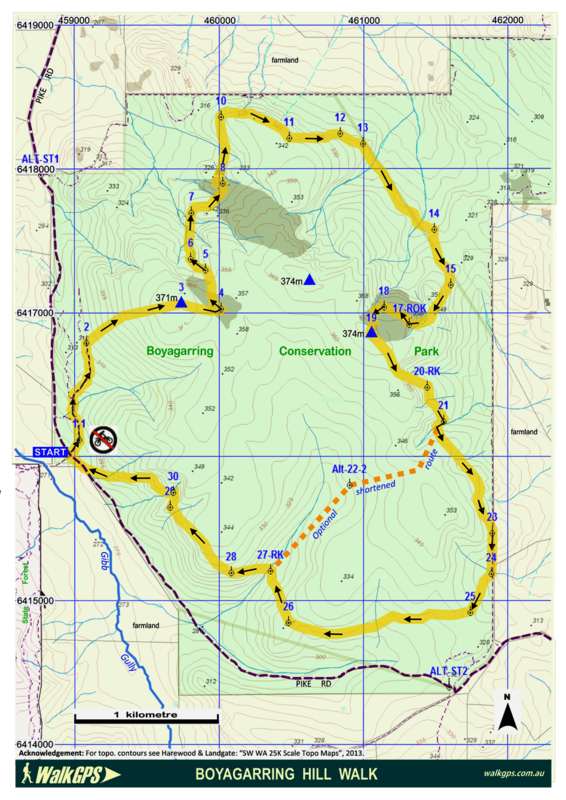 Cross the crest of a broad spur ridge at ‘26’, picking an easy way through patchy shrubland, then veer right to head NW downslope through woodland and reach a thicket of sheoaks flanking a stream gully. Pick an easy route through the fairly dense thicket to reach a small granite outcrop at ‘27-RK’ marked with a very small cairn. Cross the adjacent stream course and head westward up a steepish hillside. Veer NW at ‘28’ to reach the laterite-capped plateau at the top of the breakaway. Continue NW across the plateau via ‘28-1’ through relatively open jarrah forest and patches of Parrot Bush. 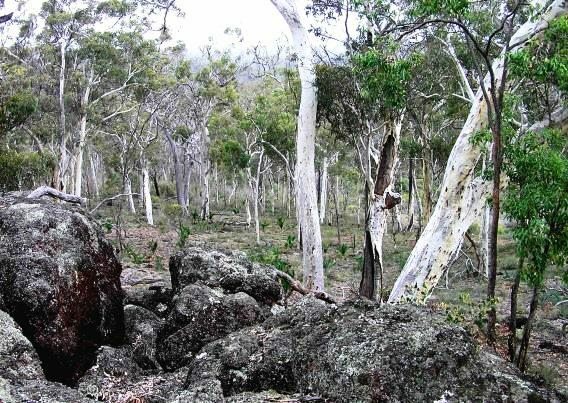 Descend NW along the upper slope of the breakaway and cross a small gully before climbing to a narrow rocky, laterite-capped promontory at ‘29’ and gaining a view westward across Gibb Gully to the nearby State Forest area. Veer right (NNE) to cross the nearby gully at ’30’, then head roughly NW along slope via ‘31’. ’31-1′. Veer westward along the steepish breakaway slope at ‘31-1’. Cross a stream course at ‘31-2’ and continue downslope to rejoin Pike Road at ‘31-3’. Turn right to follow the road NW for just over 100m to return to the start point. Option, for shortened walk (~11.5km) after waypoint ‘22’: You can bypass the SE section by taking a short cut from ‘22’ to ‘RK2’: Continue SW up the gully from ‘22’ through open woodland to reach the crest of the ridge and the edge of an area of quite thick Parrot Bush and Pingle at ‘Alt-22-1’. Then head WSW, following kangaroo trails and gaps in the denser shrubland to reach ‘Alt-22-2’. Then veer SW again to soon leave the shrubland and re-enter open mixed forest, heading gently down the valley to rejoin the route as described above at ’27-RK’. This short cut reduces the total walk distance by about 1.6km. 95km SE of Perth. Follow Brookton Highway for about 80km from Albany Hwy; turn off at Pike Road (gravel/dirt road on right, about 3km past Beverley Westdale Rd turnoff); follow Pike Rd for 9.5km to start point at waypoint ‘START’ at the corner of a side road (vehicle track) which meets Pike Road just after Pike Road curves slowly left along the SW boundary of the park. Park at ‘ALT-ST1’ near Park sign at NW corner of the Park, 7.5km along Pike Road from Brookton Hwy (where a vehicle track meets Pike Road on left, just past “Ballardon” homestead access road on right.There are no facilities.) Park near start point, but don’t block Park perimeter track. If starting your walk from here: Follow the perimeter track eastward uphill and then head ESE off-track to join the described route at about ‘7’, bypassing the earlier waypoints. After reaching ‘31-2’ continue on to ‘1-TRK’ and follow the informal track northward via ‘1-1’ and ‘2’ then veer NW to rejoin Pike Road about 0.5km south of your start point. Park at ‘ALT-ST2’ for an alternative Start point with more space for cars. Follow Pike Road for about 12km from Brookton Hwy to arrive at a vehicle track on left just before a road T-junction close to the SE corner of the Park. If starting your walk from here: Head westward back along Pike Road for about 500m, then head NW-ward off-track to join the described route at ‘25-2’. After arriving at ‘24’ toward the end of the walk, simply continue southward along the park perimeter track to get back to your start point (bypassing ‘25’). The walk route is never more than 1km from either Pike Rd (in the west, SE and south, or the Park boundary road (rough vehicle track) to the north and east (see map). There are no vehicle tracks through the central area of the Park. “Exploring Wheatbelt Woodlands”, Mike Bamford, 1995 (CALM publication; ISBN 0 7309 6495 7). 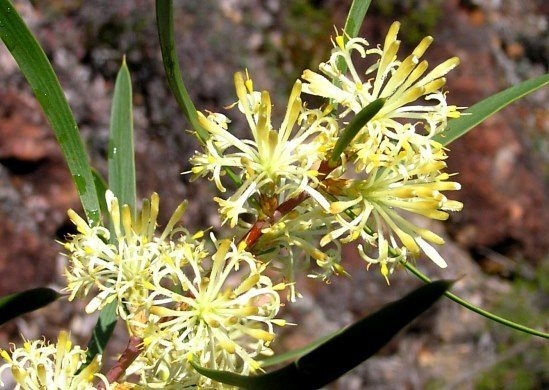 – Provides a good introduction to the flora and fauna of remnant woodlands in the region. 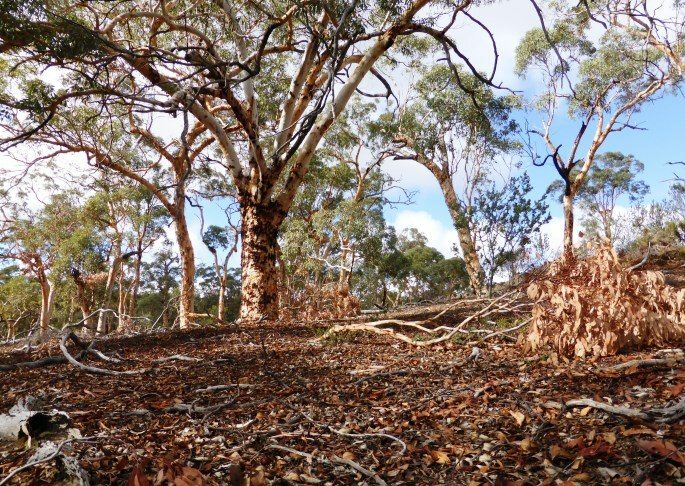 “Exploring Wheatbelt Woodlands – Teaching Activities for Upper Primary Schools”, Lyn Chadwick et al, 1994 (CALM publication; ISBN 0 7309 6320 9). 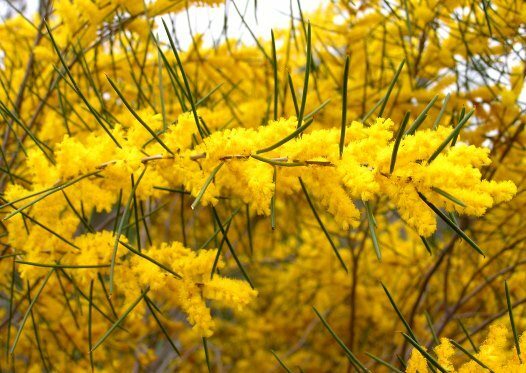 – A useful aid for anyone interested in introducing children to the flora and fauna of remnant woodlands in the region and helping them understand and value the remaining woodlands. “South West WA 25K Scale Topo Maps”, Greg Harewood & Landgate, 2015. – Digital raster; ECW format on 16GB USB. See tiles #453-2233-III-NW and #455-2233-III-SW for relevant map coverage. A very nice little walk. Click on this link for a superb fly-by preview! View to farmland from near northern boundary of the park. 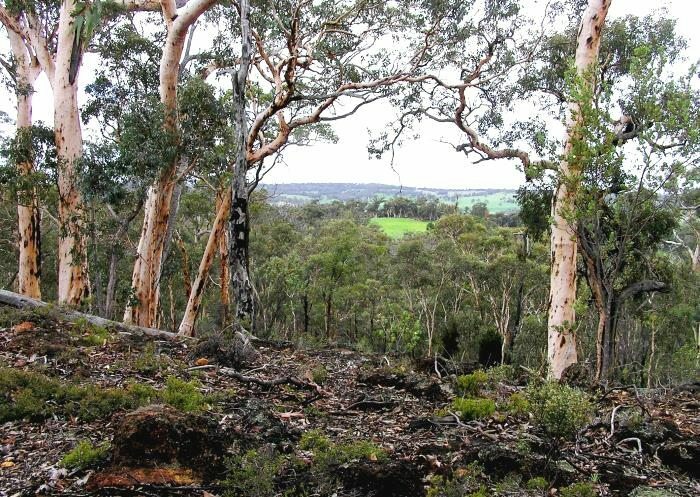 View SW across Gibb Gully to Darling Range (State Forest area outside of Park). 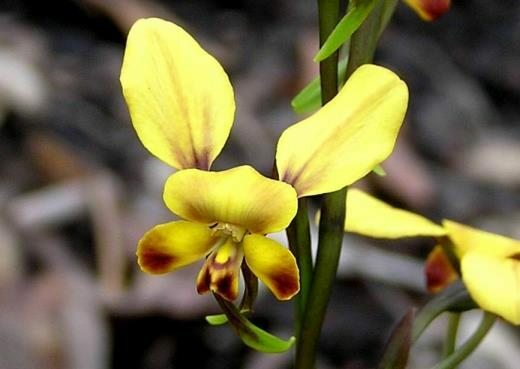 Common Donkey Orchid (Diuris brumalis). The glow of tannin-coloured wandoo trunks after autumn bark shedding. Laterite breakaway slope in NW. On breakaway slope in north. View to farmland to north from laterite breakaway. Wandoo on breakaway slope in east. Curiously weathered, cavernous rock in east. 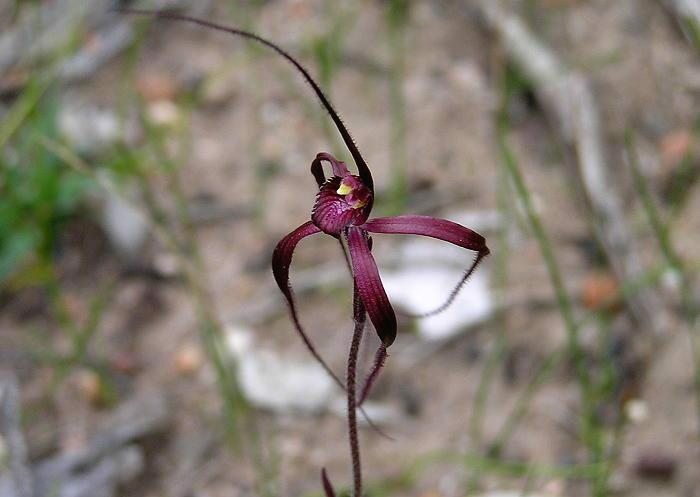 Blood Spider Orchid, Caladenia sp. (?filifera).